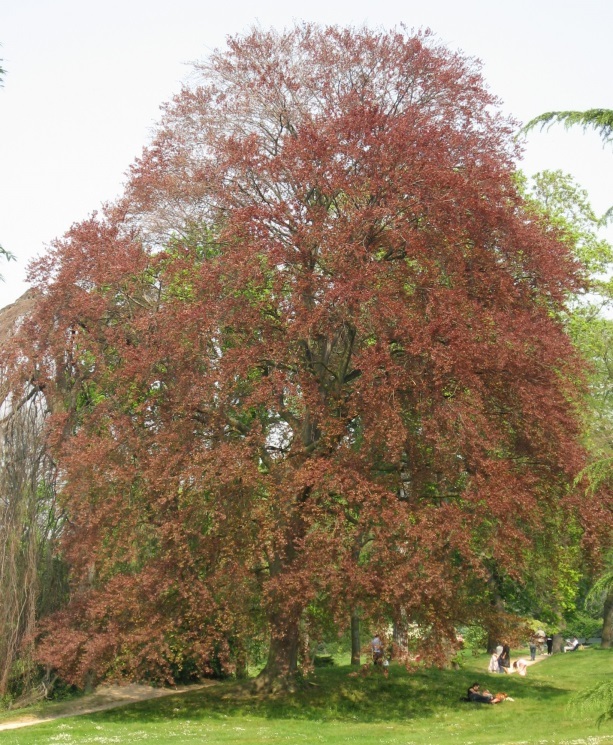 Fagus sylvatica is a tree similar to F. grandifolia, bark somewhat darker. Leaves alternate, stalk 0.5-1 cm long, blade 5-10 cm long, 4-6 cm wide (Dirr 1990) egg-shaped to elliptic, tip pointed, base broadly wedge-shaped to rounded, margin more wavy, not sharply toothed, veins 5-9 pairs, buds shorter than American beech; ‘Atroponicea’ Copper beech, (leaves dark reddish). Flowers like those of F. grandifolia. Frequency in New York City: Infrequent except as a horticultural specimen. Habitat: Rarely escapes from cultivation. Notes: Sometimes substituted for American beech by nurseries.